We have come to the end of the Abraham and Sarah cycle of stories and next week we will move into the Jacob cycle. Often I think we look upon these Biblical characters as larger than life and as models of great and heroic faith. One of my goals in preaching on these texts for this summer is to try to bring them down to earth and to help us see that they are just human beings like you and me, who can at moments exhibit great faith and courage (such as when Abraham packs up and moves his household south on the basis of God’s command – chapter 12; or even when Abraham takes Isaac to be sacrificed on Mount Moriah – chapter 22). But then there are also moments of great failure, weakness and unfaithfulness (like all of their dealings with Hagar and Ishmael – chapters 17 and 21, and Sarah’s cynical laughter in response to the 3 visitors – chapter 18). In this they are like us. So we come then to chapter 24. Sarah dies in chapter 23 just prior to the events narrated in our text for this weekend. The Rabbis tell the story that when Abraham told Sarah that he believed God had commanded him to offer Isaac as a burnt offering and that he almost completed the act before he was stopped at the last moment and offered the ram caught in the ticket instead, Sarah was so distressed by hearing this that it caused her death. We can certainly understand why the ancient Rabbi’s saw this as Sarah’s reaction, but her death also reveals to Abraham another problem. IF God’s promise that the descendants of Abraham will be as plentiful as the stars in heaven (Chapter 16), then one unmarried son is not going to be sufficient. 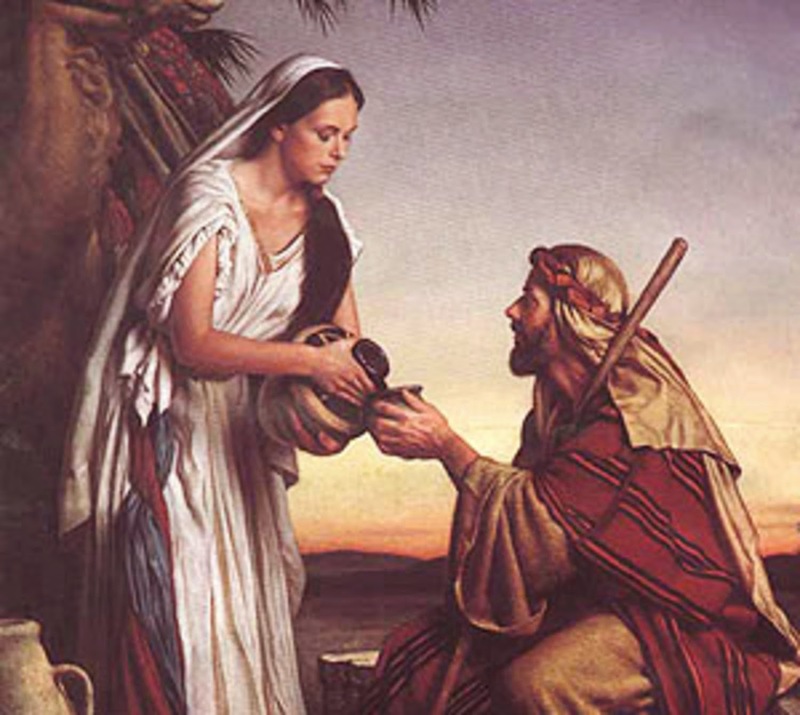 And so Abraham sets about the task of securing a wife for his son Isaac. Now, the process of courtship and finding a wife in antiquity is really quite foreign to our 21st century American experience. Marriages were arranged. Marriages were more like property transactions and the over-riding issue was children and inheritance. Love and attraction were completely irrelevant. The fact that Isaac falls in love with Rebekah by the end of the story (24:67) is unusual and not even important to the narrative. It is also important to note that there is no indication that Rebekah felt the same affection for Isaac (except for the fact that when she first sees him – according to the Hebrew – she falls off her camel – but you could take that a couple different ways! ), in fact next week we will find in Rebekah a very manipulative woman who manages to completely undermine her husband’s will at the expense of her older son, Esau. But for now, this story introduces us to a colorful cast of characters – in addition to Rebekah (who is really quite a remarkable woman, able to draw hundreds of gallons of water from the well to provide water for the 10 thirsty camels – camels can drink upwards to 30 gallons of water each in a single sitting!) We also meet her brother Laban, who is very interested in furthering his own wealth and influence (see 24:30!) and will become a very important player in future events with his nephew, Rebekah’s favorite son, Jacob; and then there is the very faithful but very shrewd servant who is able to avoid all the land mines of these delicate negotiations. Throughout this all, God purposes are fulfilled, the covenant is maintained but yet in this story there is no direct intervention to make sure this occurs. And this is the point. This is an ordinary story, about ordinary people following the dictates and expectations of their society – securing a wife, negotiating the terms, a slave following the direction of his master, a young woman fulfilling her responsibility to her family as she understood it. There are no lightning bolts, burning bushes or voices from heaven here. But yet God is present and active throughout the story. And this is the message for us – that despite our human expectations nevertheless most of the time “the workings of God are not spectacular, not magical, not oddities. Disclosure from God comes by steady discernment and by readiness to trust the resilience that is present in the course of daily affairs.” (1) That is where we find God’s presence most of the time: in the course of our ordinary lives. And it in this context that we experience God’s blessings and gifts, no lightning bolts, no epiphanies, but rather in the simple act of offering a drink of cool water to a parched and weary traveller. So I invite you to do just that. Take a moment to reflect on the gifts that God has bestowed upon you so freely; upon the blessings you have received, but especially the gifts and blessings that you may take for granted, or overlook completely. And then let us give thanks to God for these wonderful gifts, for the blessings that God so richly bestows upon us. Amen! (1) Quotes from “Interpretation Commentary Series: Genesis” by Dr. Walter Bruggemann, page 201.